Just out. The warrior Mental Sun and friends keep workinonit. Enjoy! Thanks brotha Mental Sun! As for me, I’ve kept linking to random nice things lately, instead of writing long articles, because I’m still finishing up this novel. Coming soon, in late July, I’ll be co-hosting a sustainability/ food co-op/ community gardens tour in Brooklyn with my homie who teaches at Kingsborough Community College, and I’ll be posting a lengthy write-up on that (I’ll be done with the novel by then). That’s just the beginning of the next phase of things around here. 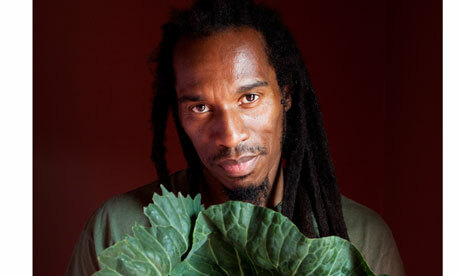 ‘Til then, the Guardian UK has a nifty interview up today about Mr. Benjamin Zephaniah, an awesome UK-based Afrikan (via Barbados and Jamaica) poet I’ve long admired. We’re of the same feather – we both went vegan at age 15, and we’re both Kung-Fuists! Read the interview. This is like a two-birds w/ one stone shout-out, for both another vegan brother and a fellow creative. The Observer Food Monthly over there has as their magazine feature vegetarianism in general, some basic stuff, though comparatively progressive since I’ve never seen, say, the New York Times Magazine shine this much light on vegetarianism, and wouldn’t expect it – they’re still having a hard time taking Michael Pollan seriously at the editorial level, whether or not his stuff gets published with NYT from time to time. Also, the “Raw Okra Stew” I’ve talked about earlier? Forget that name. I am now calling it “the Green Garvey.” Copyright the Precision Afrikan 2010, if necessary. Wait, no, “Creative” Copyright (CC), right? And it’s all 100% open-source. See? Nigeria isn’t all about the lack of government transparency. And to the thought police goblins, don’t get your undergarments all in a wedgie over this, claiming iconoclasm or unpatrioticness – I’m just trying to rebrand Nigeria like Dora Akunyili. New traditions, baby, new traditions, all day. Pro-human, pro-planet, art, music, poetry and literature from sun-up to sun-down. Wanna enjoy the new world, the new Pan-African, Pan-American, Virgo Supercluster vision of celebrations and saxophone horns that can be heard, yes indeed, in the vacuum of space (well at least in low-Earth orbit)? Then you must become mighty healthy. The Nigerian will help you on that path. And any other damn vegetable thing you like. Cukes, avos, sprouts, bell pepper, whatever. And whatever else you’d like, don’t be dogmatic – read beyond the letter of the script. So what do you do? You blend your sauce. You could use a bicycle blender to save electricity. I don’t have one of those yet. But that’s the most basic step. Then, with a bowl of that sauce handy, and after you’ve washed all your veggies, you build your tac– erm, Nigerians. How’s that go? I start with a big, massive leaf of a collard. Open that up and spread some of the sauce on it. Then, peel off a nice thick purple leaf of the red cabbage for the second leaf which forms the inner “bun.” Spread a spoon of your sauce on top of this, too. Then, you add your veggies. Now I sliced the zucchinis into thin pasta strips with my trusty julienne slicer, and peeled my carrots into wafer-thin strips with my reliable vegetable peeler. On all the tacos, after laying down the buns, the first joints I drop in there are a handful of zucchini strips. Then come the snow peas, a few okras (lob off the tips of those), the carrot slices, and finally a few tomatoes. And last, I dribble some more sauce across the top. And then I repeat, making enough of these to exhaust my supplies and satisfy my hunger. Other than fruits, it was my main “supper” the whole weekend. Extremely satisfactory and delicious, and very filling. At least to me. And my taste-buds aren’t that unusual. The minions of anti-veganism may fear the “blandness” of plants. As the great DJ Dirty Harry (Rockers) once said, Remove Ya! I and I come and change the mood! Get into this real food. Try it out. Let this crazy rasta know what you think. These joints look like Nigeria though, right? Especially if you’ve ever been down to my area, the Niger Delta. Greenness everywhere. I’m not that far off. New traditions, baby, new traditions, all day. Global citizens of hip-hop veganism and reggae revolution topped with ragas can now relish the Nigerian. Word, son! This is exactly what I’m talking about. I’ve been checking out VeganHood TV on Youtube for the past couple weeks. They are excellent. Black vegan men in Brooklyn. Showcasing the realness and teaching the family. These are the sort of cats I’ve got to collabo with once I move to BK later this year. They should win awards based on their theme song alone, I love it. When I hear those lyrics my fist is up and my head is bopping. It’s so simple and nice and the beat suggests urgency. Live and direct. Call me mad corny but this is what’s up. So I’m highlighting their work here today, supporting more productive black vegans in the family. I see you! Keep repping the cause. Black vegan straight-edge vigor forever. Black vegans ain’t going nowhere. Vegan and hip-hop are two of my main ingredients in terms of how I’d have to be defined. Vegan Hip-Hop movement? I’m ’bout that. This is the genius and beauty who has just dropped the instant classic By Any Greens Necessary: A Revolutionary Guide for Black Women Who Want to Eat Great, Get Healthy, Lose Weight, and Look Phat. The title alone is iconic and historically legit and literate to the urgency with which Africans must change their diets if we wish to actually enjoy our existence on Earth and thrive at being productive and exemplary human beings in the process. In 2010 and beyond, more Africans are awakening to the nutritional and culinary excellence of abstaining from animal products and eating herbivorously and frugivorously. The great Tracye McQuirter speaks the language of the longevity and beauty that veganism furnishes and enables for African people. I recommend her book to brothas and sistas alike. This is a raw vegan sista whose career as personal trainer, writer, lifestyle coach, fitness model, and beyond is inspiring a generation of sistas and brothas to consider how physically liberating and empowering the raw vegan lifestyle can be in combination with vigorous, righteously sweaty exercise from day to day. This is physical culture + raw veganism in action. She embodies the fulfillment of what, in an ideal world, should be easy: radiant health and genius thinking (in a beautiful black body and soul!). Genius!! Her awesome book Sistah Vegan is now just out. She analyzes the intersections of race, class, gender, ideology and forms of oppression and exclusion as pertains to women of color who live veganly, and she allows black vegan women to speak for themselves. This is the critical thought lens we desperately need as we interrogate and improve our lives as vegans of color in a world whose institutions of power and economic influence still trend towards the capitalist, the meat-centric, the exploitation-oriented, the consumption and waste-based, the arrogance of the white male and female. I plan to write a comedic/ satirical novella called Brotha Vegan in the coming months, just to stir up the pot even more; for that I owe inspiration to this gorgeous and wise sister and mother. This gentleman is an everyman bodhisattva. I remember him back when he was Richard Blackman, the fruitarian one, and he was a massive inspiration for my own movement from veganism towards raw and then low fat raw/ fruitarianism, years ago. He is a most impressive teacher, fitness trainer, athlete, scholar, spirit-genius. Jericho Sunfire might be the ultimate soul brotha one hundred. This is a man worth listening to, even if you have doubts about breatharianism and such. He has walked this walk and he is doing his thing for real. He is a leader in this black vegan, black health, Afrikan revival and revolution, Afrikans in true harmony with the planet and one another, renaissance. There are very few people in this planet I would call genius, let alone bodhisattva. This guy is dead serious, as are all the other geniuses on this page. This is a true family brother and a man who, with his wife Jinjee, brings great raw vegans together to spread human evolution as the revolution towards fitness and clean, maximally nutritious eating. This genius has raised / is raising six children who are all themselves demonstrating genius-level capacities as young vegans. To me, he is so revolutionary in the grandness of his home, his home-schooling successes, his vigorous lifestyle, the excellence he expects and receives from his children, and his radically pro-Earth and pro-human ideologies and practices. Pro-Earth: planting fruits and vegetables sustainably, planning and building sustainable homes, promoting renewable energy, minimizing negative environmental impacts and consumption and waste. Pro-Human: practicing harmony, peace and celebration within the household and beyond, sharing and teaching the art of maximal living in harmony with our rare and singularly beautiful planet. This is what I’m talking about! I wanna do it just like him when I start a family – open-minded, creative, tolerant, harmonious, loving, raw vegan, growing food, teaching the offspring everything I know so they surpass me and outdo me in their time and protect the planet, humanity and non-humans; building things together, giving birth to an army and generation of geniuses who will invent things and ideas that even young people like me in our era can’t even imagine. Hats off to Storm Talifero and his wife Jinjee for their incredible example of what is possible in a raw vegan family. All these cats above? Pure Generals of this movement. They are so human! Writing, teaching, doing the right things. This is what it’s about. I only wish to be as serious, productive and sharing as these African vegans. Check them out and learn from them. More later.